The simplest and least expensive way to control the speed of a process or piece of equipment is to operate all the equipment at full speed. Many applications require the speed of a process or piece of equipment to be varied. Prior to the advent of the AC Adjustable Speed Drive, many technologies have been used, although each has its inherent advantages and disadvantages. AC Adjustable Speed Drive (ASD) have become very popular variable speed control devices used in industrial, commercial and some residential applications. These devices have been available for about 20 years and have a wide range of applications ranging from single motor driven pumps, fans and compressors, to highly sophisticated multi-drive machines. They operate by varying the frequency of the AC voltage supplied to the motor using solid state electronic devices. These systems are fairly expensive but provide a higher degree of control over the operation and in many cases, reduce the energy use enough to a least offset if not more than pay for the increased cost. ASDs allow precise speed control of a standard induction motor and can result in significant energy savings and improved process control in many applications. ASD can also control the speed of a standard squirrel cage NEMA type B induction motor and they are suitable not only for new applications, but also for retrofit on existing motors. 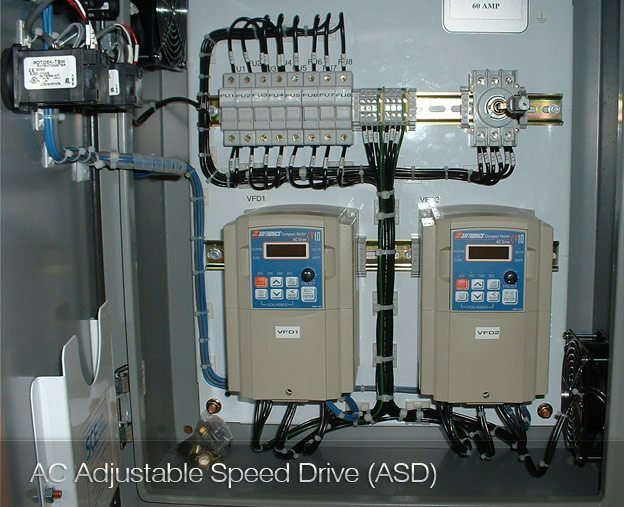 AC Adjustable Speed Drives can be thought of as electrical control devices that change the operating speed of a motor. ASDs are able to vary the operating speed of the motor by changing the electrical frequency input to the motor. Frequency = Electrical frequency of the power supply in Hz. Number of poles = Number of electrical poles in the motor stator. 4 pole motor operating on 60 hertz = 1800 rpm. 2 pole motor operating on 60 hertz = 3600 rpm. We really CHANGED speed rather than varied speed! 4 pole motor operating on 50 hertz = 1500 rpm. 4 pole motor operating on 40 hertz = 1200 rpm. By varying frequency, we can adjust the speed over a wide range or vary the speed precisely using precise changes in the electrical frequency input to the motor. ASDs actually control both frequency and voltage simultaneously to maintain a constant volts/hertz ratio which keeps current flow similar to full speed conditions. This allows the motor to draw full current at any speed and produce full torque as motor speed changes. What happens to the Horsepower when we lower the speed and torque using frequency? Reduced Horsepower = Reduced Energy Use = Energy Savings!! Some specially designed motors meant for use with ASDs are designed to operate at higher than normal speeds at frequencies above 60 hertz. Was the motor or the load it drives designed to operate at these increased speeds? ASD’s are not capable of increasing voltage so as frequency increases above 60 hertz, the torque produced starts to decrease. In order to maintain a constant horsepower output to drive our load, if speed is increased, torque must decrease! At some point of increased speed we may not be able to produce enough torque to drive the load and at this point, the motor will slow even with increasing frequency. This point is different for each manufacturer’s motor and dependant on the torque required by the load. Only the manufacturer can help determine when this occurs. Adjustable Speed Drives can be used to save significant amounts of energy in process operations compared to traditional control methods where the load or speed of the operation varies. AC Adjustable Speed Drives are among the most efficient types of speed control when used on axial (variable torque) loads like centrifugal fans, pumps and compressors. As the motor reduces the operating speed of the fan, pump or compressor the horsepower required to operate the system is greatly reduced. This is a major advantage of the ASD and one of the primary reasons ASDs have become so popular in many process operations. Could you explain about using of electric motor in electric train with dc power supply of 1500 VDC? What kind of control system for speed and braking..
which motor with vfd work better,2-pole or 4-pole ( 6.6 kv) ? what is the maximum % of frequency that you can apply to an induction motor so us not to damage the winding of the motor?